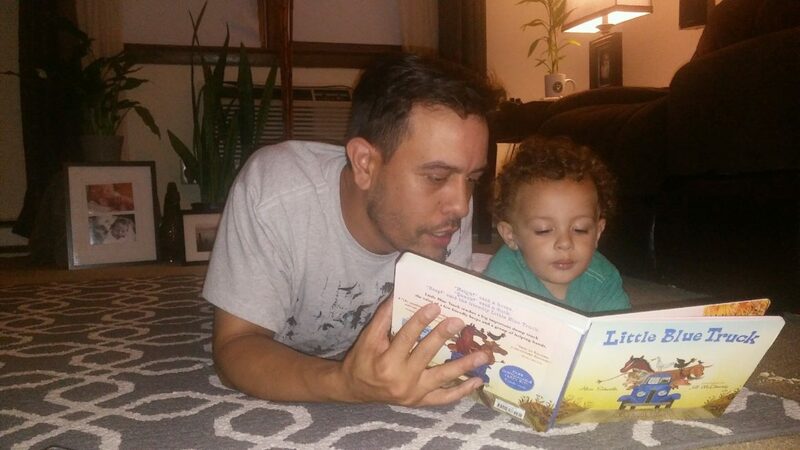 A 413 Families participant reads to his child. A community literacy campaign developed and managed by WGBY in Springfield, Mass., and multiple partners regularly interacts with parents of young children with text messages encouraging them to help their children learn to read. The campaign is bilingual and tailored to the lifestyle of parents raising children in a digital world. In addition to text messages, it uses social media platforms and a website to enlist parents as their child’s first and most important teachers. Parents opt in to receive the messages, which are sent up to three times a week. Offers of free books and other giveaways help to boost engagement. Since Text 413 Families launched in 2016, 3,000 parents have signed up to receive the messages. Organizers are working to expand outreach to build participation among more families in the region, hoping to reach 10,000 parents in the city and neighboring towns. The project was among dozens submitted by public and nonprofit media outlets to Current’s Local That Works contest, a collaboration with the Public Media Futures Forums highlighting innovative and replicable content, engagement and revenue strategies at local public media stations and nonprofit news outlets. Current and the Forums selected Text 413 Families as a semifinalist in the competition. WGBY began developing the program in 2011, drawing on a $93,000 grant from Ready to Learn, the U.S. Department of Education program managed by CPB to support preschool education initiatives of public TV stations. The grant supported planning and development of innovative educational experiences designed to increase reading proficiency. WGBY used the funds to pilot a program that communicated with parents via Google Voice. The RTL grant aligned with a community-wide literacy campaign that had launched the previous year, when a local foundation released a plan to address critical problems in early education. Results from statewide standardized tests had revealed that 64 percent of Springfield’s third-grade students weren’t reading at grade level in 2009. The Irene E. and George A. Davis convened advisory panels of educators and other community leaders — including Rus Peotter, then president of WGBY — to create a blueprint to improve reading proficiency for early elementary students. The foundation also backed a new initiative, Read! Reading Success by the Fourth Grade, to lead and coordinate a public awareness campaign. 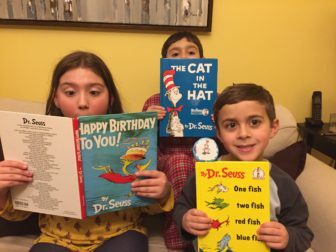 Children display their favorite Dr. Seuss books in an entry for a 413 Families photo contest. Sally Fuller, project manager of the Read! campaign, was also searching for ways to deepen engagement with families. The campaign had set a goal to increase grade-level reading proficiency for all Springfield students by the end of third grade. Fuller recognized the importance of getting more parents to read to their children. WGBY and Read! spent a year refining their campaign strategy by talking to parents and testing ways to regularly communicate with them. Text messaging was central to their approach. Most of the parents who served on the campaign’s advisory committee said they relied on text-messaging as their primary form of communication. Tyeshia Weir, a mother of two young children and one of the first to join the advisory group, said she wanted a service that would fit her busy lifestyle and provided opportunities for her children. Staff from WGBY and Read! worked with the advisory committee to customize EZ Texting, software adopted for 413 Families. The Davis Foundation provided a small grant of $4,000 to cover costs of the software, marketing and administrative support for the campaign. A team from Paul Robbins Associates, a public relations firm based in western Massachusetts, had joined the partnership to design and manage the campaign. WGBY’s role in the partnership involves administering the funding, coordinating meetings with the seven community partners and producing promotional spots of the campaign for broadcast on its air. WGBY also produced bookmarks for the campaign that are distributed through partner locations all over the city. To opt-in to receive messages, parents within the 413 area code text “413 Families” to 313131. Parents who want Spanish-language texts send “413 Familias” to the same number. Talene Jermakian manages day-to-day operations of the campaign as an account manager at Paul Robbins Associates. She writes and produces text messages to be inclusive and accessible on multiple devices — from flip phones to the latest iPhone. Each message is limited to 160 characters of text, and most begin with “413 Families,” then share a link to a website or app with detailed information. For instance, a message about the Springfield School District free breakfast program may include a link to the district’s monthly menu. Succinct messages that share links are more accessible for parents whose cell phones can’t receive messages over a certain character limit, Jermakian said. Parents with smartphones can click directly on the link, while those with flip phones must use computers to visit the recommended websites. A typical message tailored for engagement asks a question and provides multiple ways for parents to respond. For example: “What book did you and your child read tonight? Send us a picture and enter to win a Barnes & Noble gift card.” Organizers compile the photos they receive into a slideshow, convert it into a video and post it on the 413 Families website. A subsequent text message shares a link of the video with parents. Messages promoting drawings for giveaways are among the most popular, according to data collected from a recent survey of 413 Families participants. But managing distribution of the gift cards has been challenging, Fuller said. Organizers began requesting mailing addresses from those who enter the drawings. With the zip codes collected from entries, organizers hope to be able to geo-target specific information to participants in the future. 413 Families also promotes education-enrichment events of community partners that support literacy and learning. These have included a winter reading club organized by the public library, and Earth Day program at the Springfield Museum, and special programs offered by the YMCA on school holidays. Organizers see connections between text-message promotions and attendance at events, but the evidence is anecdotal, according to Fuller. Partner organizations do track attendance to gauge whether an event is successful. In April, campaign organizers surveyed 413 Family participants with a link sent through text message. Nearly all of the respondents — 96 percent — said they were likely to recommend the program to other parents. Most respondents said they want the services that 413 Families already provides, including multiple weekly messages with parenting advice and promotions of giveaways and family-friendly events. Some respondents expressed interest in information about health and nutrition, so those tips were added to the content mix. To Weir, the parent who serves on the advisory committee, the program is a valuable service for enriching her children’s education. To meet their goal to build participation, the campaign is expanding to families who reside in neighboring towns, such as Holyoke, less than 10 miles north of Springfield. A new partnership of community organizations formed the Holyoke Early Literacy Coalition with goals to improve early childhood literacy, joining with 413 Families earlier this year. Parents outside the greater Springfield area, including some as far away as Connecticut, are also signing up to receive texts from 413 Families.